On December 6, 2004––more than three years after the crash of American Airlines Flight 587 (AA 587)––the NTSB released the full version of their Final Report on the crash. The report was made available as a download from the NTSB's web site at: http://www.ntsb.gov/publictn/2004/AAR0404.htm and only in recent weeks mailed out in hardcopy. The National Transportation Safety Board determines that the probable cause of this accident was the in-flight separation of the vertical stabilizer as a result of the loads beyond ultimate design that were created by the first officer's unnecessary and excessive rudder pedal inputs. Contributing to these rudder pedal inputs were characteristics of the A300-600 rudder system design and elements of the American Airlines Advanced Aircraft Maneuvering Program. For those who were present at the Meeting, what the NTSB was really saying came through loud and clear. AA 587 encountered mild wake turbulence. Investigators who participated in simulations of the flight felt the second alleged wake encounter was "barely perceptible". The Pilot "inappropriately handled" the aircraft and set off a chain of events that led to the separation of the tail. There was no reason for the Pilot to react the way he did. His overreaction was worsened by an overly sensitive rudder control system and by some negative wake turbulence training he had received from American Airlines. But had he not overreacted and applied unnecessary control inputs . . . AA 587 would not have crashed. The NTSB used the words "excessive", "unnecessary", and "inappropriate" close to a dozen times in describing the actions of First Officer Sten Molin. Mr. Stan Molin, the father of the Pilot, himself a retired airline Captain, was sitting near the front of the NTSB's conference center in Washington, D.C. He had expected that his son was going to take a large part of the blame––this had been leaked to the media by the NTSB or Airbus almost a month before the meeting. Mr. Molin, who taught Sten to fly, had a sense, just days after the crash, that the NSTB would lay the blame on his son. Even though they knew this was coming it was still very unpleasant for the Molins to hear the NTSB says the words –– "excessive", "unnecessary", "inappropriate" –– again and again and again –– in reference to their son's piloting. The Molins did find some consolation in hearing some of the NTSB investigators (later in the day) state that their son had gotten caught up in a piloting phenomenon called adverse Aircraft Pilot Coupling (APC), although this wording is not found in the probable cause statement. To explain this in lay terms –– it basically means that due to a very sensitive rudder pedal system (never mentioned in the AA training program because Airbus never disclosed its unique nature to the airline), the Pilot quickly got caught up in a situation where, the NTSB believes, he didn't know that the side-to-side (lateral) forces he was sensing were mostly caused by his own rudder movements. As he repeatedly tried to compensate with the rudder, he made matters worse–– to the point where, in just seven and a half seconds, the tail broke off. Adverse APC implies that there is a design/systems flaw that confused the Pilot and the two “systems” are equally responsible in the subsequent failure. But the way in which the NTSB presented their findings, and the way in which they critiqued the Pilot's actions over and over again, left no doubt in the minds of the major media: "Pilot Error" was the cause, and that is how most reported it. Airbus walked out of the final report meeting with a big "whew" written across their heads. It could have been much worse for them. As one Airbus lawyer was leaving the conference center he stated to a Pilot's Union representative, "better luck next time". The Airbus lawyer was referring to intense lobbying by both American Airlines and the Union (even up to the night before the meeting) to get the NTSB to highlight Airbus' 1997 failure to communicate known defects with the A300-600 rudder system and the role that rudder reversals played in the American Airlines Flight 903 (AA 903) accident. In that 1997 accident, the aircraft's tail experienced higher loads than the loads placed on AA 587's tail. American Airlines and the Union firmly believed there was a link between AA 903 and AA 587–– they were pushing and hoping to get the NTSB to see it that way. The fact the NTSB did not is the most obvious proof that the NTSB's investigation was compromised –– probably by the powerful lobbying by Airbus. This lobbying (by both sides) was even acknowledged by the NTSB Chairman at a breakfast meeting with reporters on January 5th 2005, and described by her as "inappropriate", "intense", and having led to a delay of the final report's release. The Chairman conceded that in the presence of such lobbying the "potential for contaminating the investigation exists". Is it possible that one party (Airbus) "contaminated" the NTSB? The family of the Pilot, American Airlines, and the Union, were not the only interested parties considerably displeased by the NTSB's conclusions. Many of the victims' families were dismayed at the findings. They couldn't believe that they had waited almost three years for a probable cause statement which placed the majority of the blame literally at the feet of a dead man. In the minds of these disappointed people –– the NTSB had failed. On March 26th, 2004, U.S.Read released an exclusive article titled, "Coverups, Foulups, and Credibility Lost". This article was not about an NTSB cover-up. It was about a five year old Airbus cover-up of very relevant safety information dating back to 1997. And it was a cover-up –– U.S.Read's analysis of the AA 587 docket material uncovered Airbus' cover-up of the rudder travel limiting system failures on AA903 in 1997. We also discussed the failures of the NTSB –– from 1997 through the present –– to identify and disclose very troubling behavior on the part of Airbus. Most importantly, we showed that even if the NTSB was correct that AA 587's tail separation was the cause of the crash, the NTSB had lost credibility in determining why or how the tail had separated. The NTSB could not be trusted to go after Airbus if that was where the evidence pointed. In fact, if one believes that tail separation was the cause of the AA 587 crash, the evidence certainly pointed against Airbus. If the NTSB was unreliable in highlighting the fairly obvious in relation to the tail separation and rudder limiter issues and the Airbus' coverups dating back to 1997 –– then the NTSB's ability to determine the actual initiating event on AA 587 was even less likely. At the Final Report meeting the NTSB proved beyond any doubt that the their credibility in the investigation had been lost. The NTSB basically let Airbus slip away on the most critical issue and even created a grossly erroneous and incomplete presentation that was favorable to Airbus. "When I heard (about what Airbus knew), [about AA 903] it made me sick ... People are kicking themselves." It would seem that Mr. Loeb got worked up about nothing –– because the NTSB went out of their way at the AA 587 final report meeting to say there was "no connection" between the two flights –– no "eureka" piece of information from AA 903 that could have prevented AA 587. Even with the benefit of hindsight available to them the NTSB's statement was very far from the truth. This is why the Airbus attorney walked out of the meeting at the end of the day and told the pilot's union representative, "better luck next time". Airbus' lobbying efforts had paid off well –– the NTSB had been rendered mostly impotent –– and the bulk of the blame had been placed on a Pilot who allegedly used the controls "excessively" and "inappropriately". Figure 1 was produced by the NTSB's John Clarke, Director of the Office of Aviation Safety, to show how the two flights weren't connected when in fact they were very similar . What is most striking about Mr. Clarke's slide is the omission of two very significant similarities between the two flights: (a) repeated rudder reversals leading to (b) higher-than-ultimate loads being placed on the vertical stabilizer. These are the two most important issues related to both flights –– and it was these that John Clarke omitted from his slide. Mr. Clarke is either incapable of connecting the dots or he was willingly evading the facts to help Airbus escape blame. Either way, this is an egregious failure on the part of both Mr. Clarke and his employer, the NTSB. Instead, Mr. Clarke's presentation had "Pilot training" as the number one issue, and as the only similarity between the two flights. There is no doubt that Pilot training was an issue in both cases –– both Pilots had never received training about the dangers of rudder reversals. But there is also no doubt that Airbus (a) never told the NTSB and FAA that AA 903's tail experienced loads beyond the ultimate load, that (b) the rudder reversals contributed to the very high loads, and that (c) the RTLU failed several times during the AA 903 event, which led to a direct increase in the loads experienced by AA 903's tail. Had Airbus told the NTSB in 1997 about all of these facts, when Airbus knew them, then the NTSB would have issued its warnings to the aviation community about rudder reversals, about the peculiar characteristics and sensitivities of the A300-600's rudder system, and about the failure modes of the RTLU. Had the NTSB done so in 1997, AA 587's Pilot, Sten Molin, would have known not to reverse the rudder long before November 12,2001. The NTSB was able to look at these same facts, these obvious connections between the two flights, and state that nothing from AA 903 could have prevented AA 587. This NTSB distortion and whitewash of the AA 903 affair solidifies the conclusion that the NTSB had lost credibility in the AA 587 investigation. If they were incapable of connecting the obvious dots, they couldn't be expected to identify the actual, elusive, initiating event on board AA 587. Perhaps one clue as to why the NTSB reached this illogical conclusion about the AA 903 connection is found in Mr. Loeb's statement to USA Today: "People [in the NTSB] are kicking themselves." 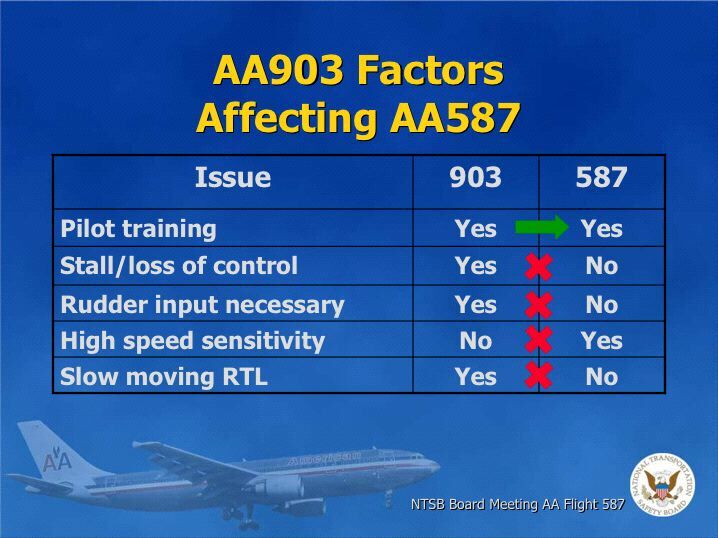 Perhaps the NTSB was encouraged to downplay the significance of AA 903 in an effort to veil the significance of their own failures in the AA 903 investigation. Why else would Mr. Loeb say "kicking themselves"? Board Member Rosenker said he was "comfortable" that there was no relation between AA 587 and AA 903. Board Member Carmody: "we need to lay this thing (the AA 903 connection) to rest". She also described her feelings about the Airbus' 1997 cover-up as "[I] am less than satisfied in a less than perfect situation". Director John Clarke focused solely on AA903's "vertical" loads (which were higher than AA 587's) and failed to highlight the extremely high lateral loads AA 903experienced (as high as 0.7g)––loads that were as much as two times more severe than those AA 587 experienced. Mr. Clarke referred to Airbus' deliberate withholding of the tail loads data during the AA 903 investigation as ..."oblique". What made Mr. Bernard Loeb "sick" was only an "oblique" offense for Mr. Clarke. NTSB Chairman Connors provided the closest statement approaching a rebuke when she said Airbus "did not meet moral obligations". But that was the height of the criticism against Airbus––it quickly descended into a love fest again with Board Member Hersman, perhaps exposing the NTSB's bias in favor of Airbus, revealing "we don't want to single out a single party". Unfortunately, the NTSB's final report did just that––it mostly singled out the Pilot. What really happened on board AA 587? This central question is really what it's all about. U.S.Read followed the investigation closely for three years because never during that time did we see the NTSB addressing the central issues of the crash. In our previously released preliminary report, we highlighted the findings that led us to conclude that (a) there was a fire or explosion on board at least several seconds before the tail separated (this is suggested by physical evidence––the flight recorders evidence––and eyewitness statements), (b) the crew lost control of the aircraft while the tail was still attached, and (c) the tail did not detach until just after the time of the large flash and smoke/mist trail seen on the tollbooth video. In other words, the tail separation was a consequence of the crash sequence and not the initiating event, and the aircraft would have likely crashed even if the tail remained attached. The NTSB's Robert Benzon stated at the meeting that "pertinent portions" of Jamaica Bay were searched with sonar scan equipment and that no debris was found on the Bay floor. This is misleading and unbelievable in two respects. The NTSB did not identify the area covered by these scans. Secondly, the NYPD (the agency which performed the sonar scans) told U.S.Read that they did not scan a large area nor was their scan focused for "debris." Rather, it was focused on finding the bodies of victims. The NYPD acknowledged that their sonar scan effort may have missed aircraft debris. The NTSB made no mention of the numerous and varied land-based debris found away from the crash site, as extensively documented and described previously by U.S.Read. Much of this debris shows that the fuselage was compromised while the aircraft was flying. In regards to the eyewitnesses, the NTSB concluded: "The witnesses who reported observing the airplane on fire were most likely observing a fire from the initial release of fuel or the effects of engine compressor surges." Mr. Benzon added that there were "several" witnesses who reported the plane on fire. "Several" does not accurately represent the number of eyewitnesses who saw the aircraft on fire. There were over 70 witnesses who saw the aircraft on fire while it was level–– before it had begun its nosedive. There were at least 27 witnesses who saw the aircraft explode or on fire before the tail separated. The NTSB conveniently ignored the most disturbing aspect of the eyewitness accounts. Not only did witnesses describe the aircraft on fire before the engines separated, but many saw the aircraft on fire long before the tail separated. As we have previously reported, the NTSB showed no interest in acquiring the original tollbooth videos from the FBI––videos which show AA 587 in flight during the most critical moments. Just months before the close of the investigation, one of the parties to the investigation pushed the issue with the FBI and the FBI finally released the original videos. They ended up at the NTSB in late May of 2004––two and half years after the crash. On February 25th, 2005, the NTSB responded to our request for a digital uncompressed copy of the original footage––we are currently working out the details with the NTSB as to how a copy will be made for us. In the interim, the NTSB has offered to send us a broadcast-quality Betacam SP video tape––a first generation copy from the originals (not digital, but the best alternative). As soon as we have the opportunity to examine this new footage we will report on it. Based on the NTSB's latest official report on the tollbooth videos, there is a notable quality improvement in the original videos along with additional footage and even an additional camera view (lane 13 of the toll plaza) of AA 587 in flight. We are very much looking forward to examining the videos. The NTSB, in their latest tollbooth video report, provided snapshots from the original video and from the copy they received from the FBI in November 2001 which highlight the quality difference between the two versions (see Figure 2). The latest NTSB report failed to identify what techniques were employed in an effort to analyze the original videos, all they say is that there is nothing new. U.S.Read has learned that analysts at the U.S. Government's Ballistic Missile Defense Organization (BMDO) have, in the recent past, been able to improve images from poor quality videos (an ability that exceeds even those at the FBI). But this is yet another area the NTSB has failed to to explore. The NTSB's final report provided no indications that other significant issues were thoroughly investigated. An NTSB sound spectrum analysis of the Cockpit Voice Recorder (CVR) revealed dramatic energy level increases during the time of the Pilot's aggressive control inputs. The sound spectrum study, along with the Air Traffic Control (ATC) tapes––which contained the Pilot's "try escape" transmission that is missing from the CVR––provide convincing evidence that the crew was battling something far more severe than a wake encounter. Reliable electrical systems on board were being disrupted several seconds before the tail departed. To the dismay of many, not only has the NTSB failed to properly analyze the CVR, but they have gone so far as to say that the Pilot's "try escape" transmission didn't even originate from AA 587. The NTSB also provided no explanation for the failure of AA 587's Flight Data Recorder (FDR) 13 seconds before impact and several seconds before the engines departed. Yet, the NTSB's John Clarke somehow was able to say that everything was "normal" on the CVR and FDR. In all likelihood, the truth of AA 587 will never be fully discovered. The same apathy the NTSB showed in their analysis of the tollbooth videos was seen throughout their investigation––in areas that might have led them down a different path. They missed or evaded the clues that pointed to the initiating event (most likely a fire/explosion). The only hope that may remain is if enough family members petition Congress for an independent re-investigation of AA 587. U.S.Read has been informed by two families that they intend to do just that. We welcome your comments and feedback on this article at U.S.Read's new web log at: http://usread.blogspot.com/ or you can send us an email by clicking here.